The order carnivora includes over 260 mammals, predominantly carnivores, with a couple omnivores and one herbivore, the giant panda. There are eighteen Families within the Order Carnivora. There are members of the Order Carnivora throughout the world. They are typically highly territorial and will defend their ranges with passion. All members of the Order Carnivora have a characteristic skull shape and they have prominent canines and carnassials. The skulls of carnivores are strong and designed so that they can use their razor sharp teeth to the utmost efficiency. The trade off is that the jaw can only move up and down -- there can be no sideways motion. The canines are the longer, curved teeth that are used for stabbing prey. The carnassials are teeth that cut up the meat once it is in the mouth. Also, most big cats have a tongue so strong that it can basically lick the meat off the bones. Carnivores have highly advanced brains, for non-humans, which allows them to hunt efficiently. Carnivore senses are highly advanced, especially their sense of smell. Many carnivores have long flexible bodies which allow them to run fast, climb trees, tackle prey, and perform many other physically demanding feats. 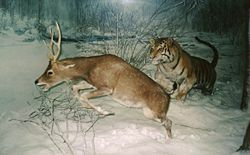 Many carnivores can run rather fast, even if only for a short while. In general, members of the Order Carnivora only breed once a year. They can have from one to more than twelve babies, depending on the species. Most young are born blind and without fur. Members of the Order Carnivora live throughout the world. Ailuridae live throughout the Eastern and Southern Asia. Amphicyonidae fossils have been found in northern Canada and Alaska. Canidae live in North America and Africa. Felidae live throughout the world. Herpestidae live in Asia, Africa, the Caribbean, and southern Europe. Mephitidae live in Indonesia, the Philippines, and the Americas. Miacidae live throughout the world. Mustelidae live throughout the world. Nandiniidae live in Eastern Africa. Nimravidae fossils have been found in North America, western Europe, and China. Odobenidae live in the cold arctic seas of the Northern Hemisphere. Otariidae live throughout the world. Phocidae live throughout the world. Procyonidae live in North America and Europe. Ursidae live in North America. Viverravidae fossils have been found in the Americas. Viverridae live in North America, Europe, Asia, and Africa. This page was last modified on 26 July 2014, at 11:50.